Looking to go off road for the first time? Here are tips and advice you need to make your introduction to mountain biking fun and successful. While only lots of riding, great fitness and endless bailouts into the bushes will make you the hottest rider on the block, here are some basic skills that every aspiring mountain biker should know. In part two of this looks at essential mountain bike skills, learn more about specific on and off-road obstacles you are likely to encounter. Thinking of heading off road? 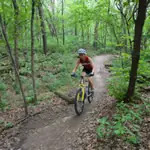 Don't let knobby tires and bumps in the trail discourage you. Here's how roadies can make the switch to mountain biking. One of the more difficult concepts for beginners to understand is how and when to shift gears. Proper shifting can make a tough climb easy and save wear and tear on your components. When you're on the trail, sometimes the only way to get past an obstacle is to go over it--not riding over it, hopping it. Here's how to successfully bunny hop. 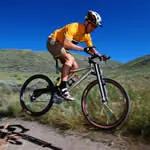 Whether you want to smoothly descend near-vertical downhill sections or just ride your local trails without crashing, these tips will having you rolling with confidence. Ready to go? Search for a mountain bike event..